Children's Bureau celebrates November's National Adoption Month. Adoption is a meaningful way for individuals and couples to fulfill their dream of parenting. There are approximately 64,000 children in foster care in California. Los Angeles County’s foster care population exceeds 21,000 children with 500 foster children waiting to be connected to a family who will adopt. Children’s Bureau offers a comprehensive foster care and adoption program that brings families together for a lifetime. The agency is in need of resource families for children in foster care while reunifying with birth families or to provide legal permanency by adoption. 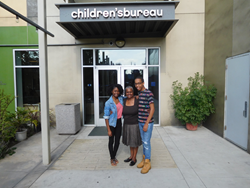 Children’s Bureau Resource Parents protect and nurture children, meet children’s developmental needs, support children’s relationships with their birth families and do all of this as a member of a professional team. Children’s Bureau welcomes every foster and foster-adoptive parent regardless of, race, age, religion, disability, marital status, ethnic background, sexual orientation, gender identity or expression. Qualifying families receive training, certification and support. Resource parent, Melissa Sommer, advises potential resource parents “to come into it with an open mind and an open heart. Be prepared to care beyond anything you could have ever imagined.” Watch more Children’s Bureau resource families share their foster-adoption experiences here. Discover if you have the willingness, ability and resources to take on the challenge of helping a child in need. A monthly information meeting is being held Saturday, Nov. 19th from 10:00 AM to Noon at Children’s Bureau, 1910 Magnolia Avenue, Los Angeles, CA 90007. An information packet or application may also be requested by filling out a request form on the website at http://www.all4kids.org. Since 1904, Children's Bureau (http://www.all4kids.org) has been a nonprofit leader in the prevention and treatment of child abuse and neglect. More than 30,000 children and families are helped each year throughout Southern California with services that include school readiness, parenting classes, family resource centers, support groups, mental health counseling, foster care and adoption. Children’s Bureau is one of the largest investors in child abuse prevention in the country and is developing a national model to transform an entire at-risk community through its Magnolia Community Initiative.